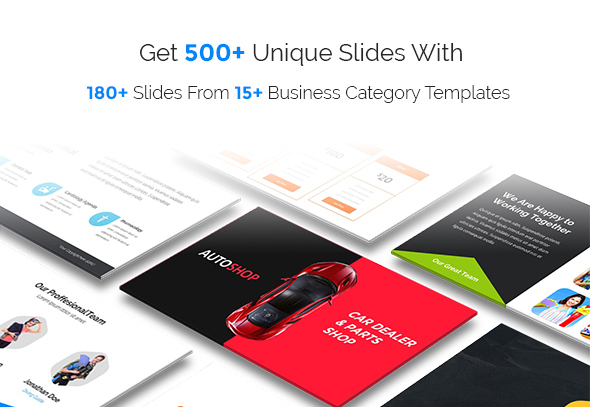 PowerPro – Multipurpose Business Powerpoint Template is a professional collection of graphic, slides, diagram, template, etc. to build your own great presentation, you can get over 450 unique slides that you can use it for various business and presentation purpose such Language Course, Cleaning Services, Medical Services, Automotive Dealer, Band & Musician Profile, Construction Services, Diving Course, Fashion, Photography Services, travel agency, creative agency, technology startup, cafe & restaurant, barbershop, app demo, fitness, and many more. Everything you’ll need for presentation is available on this templates!. Let’s make a great impression from your audience! and make your sucessful presentation by using this template!